When we set off on holiday early one morning, we were anticipating a fun filled holiday with lots of laughter and smiles, but when our two year old daughter vomited all over the back seat just an hour into our journey, my husband and I looked at each other and wondered what we were getting ourselves in for. That was one lesson I learned the hard way – don’t give my children a full bottle of milk before a long journey, because it’s sure to greet us again down the road. My family and I spent three years living in Outback Queensland, so driving was a huge part of our lives. It took us two hours just to get to the supermarket to buy groceries and holidays to the coast were about twelve hours more. So during that time we’ve slowly built up a list of must do’s and must take’s on road trips, to make our lives (and the journey’s) a little easier. It’s quite obvious really, but one important thing we discovered is that the kids need to have a good sleep the night before the trip. We used to think that if they stayed up late the night before then they’d sleep through the journey the following day, but that wasn’t necessarily the case. Sleep deprived and overtired children can be difficult to deal with at times and there’s nothing worse than having two screaming toddlers in the back, refusing to succumb to the call of sleep. Our children are always much calmer and well behaved if they’ve slept well the night before. I don’t know about your kids, but ours have stomachs that resemble bottomless pits, so it’s imperative that we take plenty of food on our trips. I always make a batch of sandwiches and have some fruit, snacks and of course a few treats on hand to get them through the journey. Hungry kids are frustrated kids, so having easy access to food is an easy way to keep them content. But go easy on the sweets and milky products because if you give them too much, you might just find yourself cleaning it up again off the backseat. I find it’s always a good idea to take an item that our children love with them on a trip. Our kids love their cot blankets so we always ensure they have them in the back which makes them feel more comfortable and calm. Your children may have a favourite soft toy that will soothe in the same way. Also pack some toys that you can take in the car to keep them amused and I’m not talking about those loud musical instruments that will surely drive you mad, but perhaps some smaller toys that will keep the kids amused without annoying everyone else around them. Keeping children occupied on long trips is also a no brainer. A bored child will always find some way to amuse himself, such as kicking the seats on front of him, annoying his sibling or just being a general pain in your side. Playing games with your children in the car is a great way to pass the time and most of the time they’re learning without even knowing it. I Spy is an oldie but a goody and it teaches young children different words. Do a virtual scavenger hunt on the trip. Before you leave make a list of everything your child needs to spot on the journey i.e. a red car, a sheep, a green sign etc. and of course have a prize once your child has spotted everything. Singing is also a lot of fun with your children. We have a CD full of nursery rhymes and occasionally we pull it out to have a sing along. On long trips we find it very helpful when we can turn on a DVD and the kids can happily watch a movie in peace. Purchase the ones that attach to the back of the front head rests so your children can’t fiddle with the buttons and have a good selection of movies or shows, alternating between what each child wants to watch. Most DVD players these days plug into the cigarette lighter for power but if yours are battery operated ensure they are fully charged. I have no doubt it will be an absolute calamity if the batteries run out of juice half way through a movie. When our son was a baby and needed a bottle warmed up I remember many a time when we would park up on the side of the road and heat up a pot of water on the gas cooker just to warm his bottle in (whilst he was screaming blue murder). Now there is a much easier way and I can’t believe I didn’t get one sooner. A bottle warmer costs about $15.00 and it’s one of the best investments we ever made. They plug into the cigarette lighter and you slip the bottle into the insulated padding which then warms the bottle on the go. It can take some time to warm up though, so make sure you allow about fifteen minutes for it to warm. 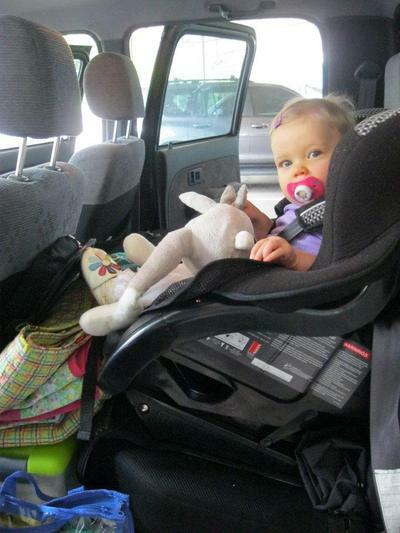 So when we head away on family road trips now, they don’t seem so daunting anymore. We’ve got a good plan in place and plenty to keep the children occupied which normally makes for a smoother trip. Of course there’s no guarantee that the best laid plans won't come unstuck with a sick child or one that refuses to eat what you’ve brought along, but at least you know that you’ve planned as best as you could. And if all else fails, there’s not a lot more you can do but ‘keep calm and carry on’. 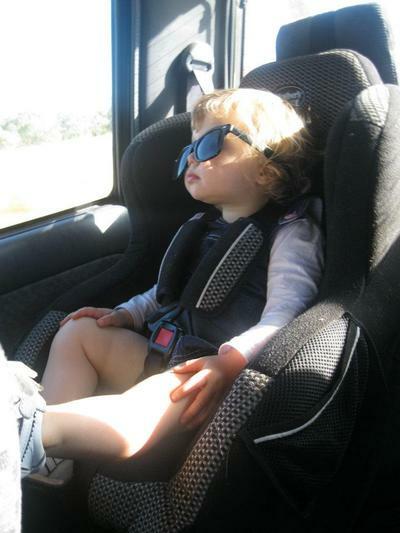 Do you have any tips for road trips with kids? On our last road trip, we were about an hour from our destination when our eldest threw up everywhere. The smell of vomit is a hard one to get out of the car! Great tips!